Background: The Philippines FA made the brave choice at the beginning of the year to part ways with Hans Michael Weiss. The German coach was responsible for transforming the side from an afterthought to a credible side not to be taken lightly. 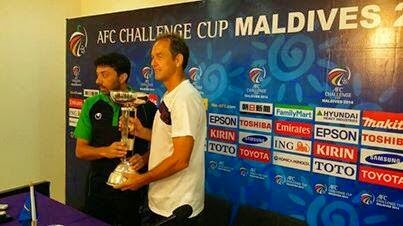 After the 2012 AFC Challenge Cup in Nepal however, things plateaued. Weiss became known as a coach untrusting of local bred talent and loyal- to a fault- to the players who had got him this far. Tactically, Philippines lacked ideas against smaller teams that defended deep- blunting any attacking threat the Azkals had on the counter. Enter Thomas Dooley. The former US international captained his national team at the 1998 World Cup and despite his limited managerial experience he does bring a good deal more to the job than his unheralded predecessor. He immediately sought out to set up the Philippines to be more comfortable in possession and so far Dooley has only been handed a single loss- 1-0 to Azerbaijan in his second game in charge. Winning Group B was beyond the expectations of most- especially after 'only' a 2-0 win over Laos but a second half surge against Turkmenistan was enough to seal it. An extra-time win over Maldives saw Philippines throw away a lead twice and they needed the help of the brilliant Roland Muller in order to deny Ali Ashfaq from the spot in the second half with the scores even at 2-2. Going into the final, the question will be whether or not Philippines has enough left in the tank after arduous journeys across the Addu Atoll, injuries, and the absence of a couple key players. Challenge Cup Squad: According to most observers this is the most talented Azkals side ever assembled. The only notable absence is the Javier Patiño- the Buriram striker has been in fine form (20 goals this season in the Thai League) but United refused to release him. That said, there's no shortage of European pedigree with eight out of the 23 man squad playing in Europe. The UFL-based contingent also have a good deal of foreign experience under their belt. Two 19-year olds Daisuke Sato and Amani Aguinaldo have really come into their own this tournament. Their performances in defence have helped the Azkals get this far but it remains to be seen how they will react to playing in a final against unfamiliar West Asian opposition. The Azkals will be without Dennis Cagara, Neil Etheridge, Juan Guirado, and Ruben Doctora in the final. Key Player: Stephan Schröck. The Eintracht Frankfurt midfielder is capable of creating something out of nothing and could be an X-factor for the Philippines- if he plays. He was forced into action against the Maldives on Tuesday when the Azkals conceded for the second time on 66 minutes. Style of Play: It's hard to define the Philippines style of play considering that Dooley has only coached a handful of games. This is a team that keeps things simple; they play a 4-3-3 with the team dropping back to defend as a unit when not in possession. Going into the final, Dooley will most likely set them up to play more defensively- two banks of four in your standard 4-4-2. Much like Afghanistan, wing play is Philippines's bread and butter so Palestine should be prepared to counter their threat.